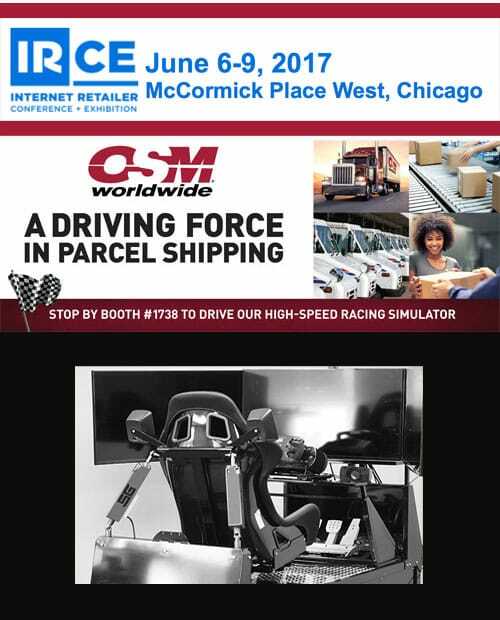 OSM Worldwide will be exhibiting at the upcoming IRCE Conference June 6-9 in Chicago. Parcel shipping consultants will be onsite to answer your questions and discuss your parcel shipping needs. Don’t miss the opportunity to learn how you can ship your ecommerce orders faster at lower rates. Visit our booth #1738 and take the wheel of our high-speed racing simulator! Have a little fun while you hear the roar of the engine and feel the snap of the gears. Do a lap around the Indianapolis Motor Speedway and see if you can get on the leaderboard. See you at the IRCE!